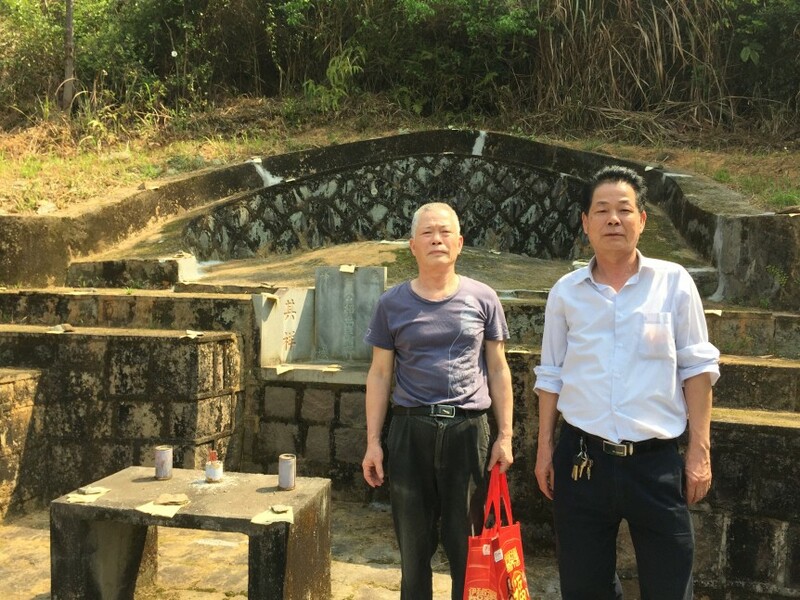 I started my trip going to Fuzhou, China where my father is from to sweep the tombs during the Tomb Sweeping Festival to pay my respects to my ancestors. In 1978 when my father returned to China the first time after 30 years away from home, he took a train from Guangzhou (close to Hong Kong) to Fuzhou. The train was so slow that it took the whole day (24 hours) to cross the neighboring provinces. According to travel restrictions, my father was only allowed to bring 5 large packages and 5 small packages from Hong Kong. Among the 5 big items were a TV and a refrigerator. The 13-inch TV became the only TV in the village that sometimes would bring a ton of people from all over the village into my father’s courtyard to watch it. My relatives were so poor that they could not afford the electricity to run the refrigerator, so they brought it out and plugged it in when my father visited them. A photo of my cousins who went up the mountain with me. They are standing in front of the tomb. I remember when they brought out the refrigerator to stock food when I visited China for first time with my father in 1990. It was the first time I had hiked up the mountain to the family tomb. The mountain didn’t have a lot of trees and the trail was clear. My cousins told me that the trail leading to the tomb was the main road for people going north to Beijing to take the national examination in the Forbidden City. The exam brought the brightest students from all over China to the Forbidden City in hopes of being the champion (狀元) – or receiving one of the highest ranking scores. A champion would receive recognition from the emperor and be guaranteed a nice government job. High-speed trains and improvements to transportation technology have changed the lives of people all over China. It used to take me five hours to go from our Shanghai office to Nanjing, but now it takes one and half hours. From Nanjing to Beijing is only another four hours on the same train. So in theory, I can stop by all three Logic offices in a day. That was unthinkable when I set up these offices back in the 2000s. Recently on the way back to the US from Taiwan, my wife and I stopped by Tokyo to see our daughter, Emily, who is now working there. Emily said that a new Shinkanshen (high-speed bullet train) just opened in the northern coastal city Kanazawa. We used our Japan Rail Passes (a pass only for foreigners to get unlimited rides) to see that city. The train was very comfortable with power outlet available in every seat, traveling at 160 miles per hour, and arriving from point to point at the precise minute it was expected. There was another type of high-speed bullet train that we experienced in Kanazawa. While we toured the city, we also made sure to check out the local restaurant hotspots. Someone at the train station tourist information center suggested we visit the restaurants around the famous fish market in the center of the city. After waiting for 30 minutes in line, we got into a popular sushi establishment. It is one of those sushi train restaurants run with modern technology. An iPad with a self-service ordering app was mounted on every table. I thought the iPad POS app system (www.touchandserve.com) that we’ve developed was very impressive, but these iPad stations were way cooler! After placing an order through the iPad app, a miniature Shinkanshen model train carried our sushi through the restaurant, stopping next to us. We took the sushi plates off the train and pressed a button to send the train back to it’s the home station. It is really cool to see “high-speed” technology compliment the traditional restaurant experience! For a country that invented high-speed internet and changed the lifestyles of a whole generation, true high-speed train is still a far-off dream for most major American cities. So many technological advances have improved the livelihoods of millions of people around the world and it will keep finding ways to make it easier. I would love to someday be able to travel to Chicago in just one and half hours. I am also craving for a high-speed sushi train with delicious sushi to come to a table near me. Maybe we’ll see sushi trains in restaurants in the U.S. before high-speed rail becomes available to the populace.